Let your senior speak! Often, seniors can feel unimportant or feel as though no one understands them. They need to know that someone is listening and that what they say matters. Try and ask more open-ended questions, which will show your loved one that you want to hear more about what they're thinking and feeling. How many times did your loved one sacrifice their time and effort to help you? Return the favor by helping make their life a little easier. Maybe they need help hanging a shelf in their bedroom, or they want to donate clothes to the local thrift store. Whatever the task may be, when your loved one hears, "Let me do that for you," they can see how much you care. Everyone enjoys receiving compliments! A kind word has the power to heal a hurting heart and uplift the soul. Take the time to notice your loved one's good deeds or other commendable actions, but don't just keep your thoughts to yourself! Share with them how wonderful you think they are. Your presence truly is one of the best gifts you can give your senior, whether it be a phone call at the end of the week or an in-person visit. Quality time may be your senior's love language. Reaching out on a regular basis can significantly improve your loved one's mood and your overall relationship. A hug, although a seemingly small act, can do wonders for your senior's physical and mental wellbeing! Physical touch is one of the most comforting things for not only seniors but people of all ages. Hugs, specifically, can reduce stress, lower blood pressure, and even prevent sickness. 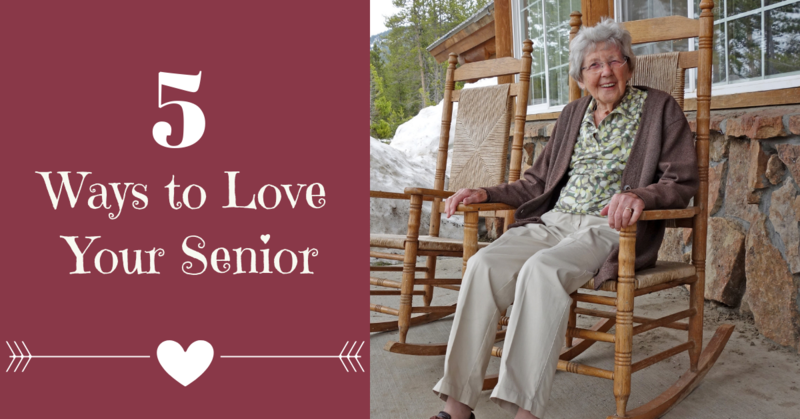 So, the next time you see your senior, be sure to give them a big squeeze!